A world of benefits on one card. Free movies, dining offers, free lounge access and much more. 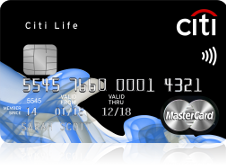 As a Citi Life cardmember you will automatically be enrolled into the Citi Rewards Program with which you can earn and redeem CitiDollars for a host of amazing redemption options which have been created keeping your needs in mind. Through the Citi Rewards Program, collect 3 CitiDollars on every AED of purchases in foreign currency and 2 CitiDollars on every AED of purchases in local currency. If you wish, you can redeem your Citi Dollars to cover the annual membership fee* for your Citi Life Credit Card. Purchase a movie ticket at VOX Cinemas through www.voxcinemas.com or through the VOX mobile app available on Apple and Android with your Citi Life Card and get a complimentary ticket for the same show. You are entitled to 2 free tickets per month and this offer is applicable only for tickets purchased online. Unlimited complimentary access to 1,000+ airport lounges worldwide for you, your supplementary cardmembers and one free guest each. Enjoy complimentary marhaba Bronze Meet & Greet service and experience a smooth journey through Dubai International Airport. Unlimited supplementary cards for your family members. You don’t have to pay any additional fee and can choose the spending limit on each card. Gourmet Pleasures from Citi is our mouthwatering dining program. Enjoy up to 20% discount at select restaurants. Browse through the whole selection now. To stay informed about your account activity, set up alerts, we'll remind you about your balance levels, payments due, or when you go over your credit limit and every purchase made with your card through the Citibank Alerting Service. Your Citibank MasterCard Credit Card comes with contactless technology, to make your transactions a faster, easier and much more enjoyable experience! If you hold an account with Citi, please visit www.citibank.ae and pay through Citibank Online; or make a deposit at a Citi ATM. We now accept payments even without your Citi Credit Card. Visit www.findmyciti.com/ae to see ATM locations. Citi Life Program and Citibank Terms and Conditions apply. For details, click here. Citibank N.A. makes no warranties and assumes no liability or responsibility with respect to the products and services provided by partner(s)/other entity(ies).